West Hillhurst is about a 45 to 90 minute walk to Stephen Avenue depending on where you live and how fast you walk. It is on the edge of the City Centre by my definition i.e. anywhere that is about a 30 to 40 minute walk from the middle of the Central Business District. That makes West Hillhurst an inner-city neighbourhood. 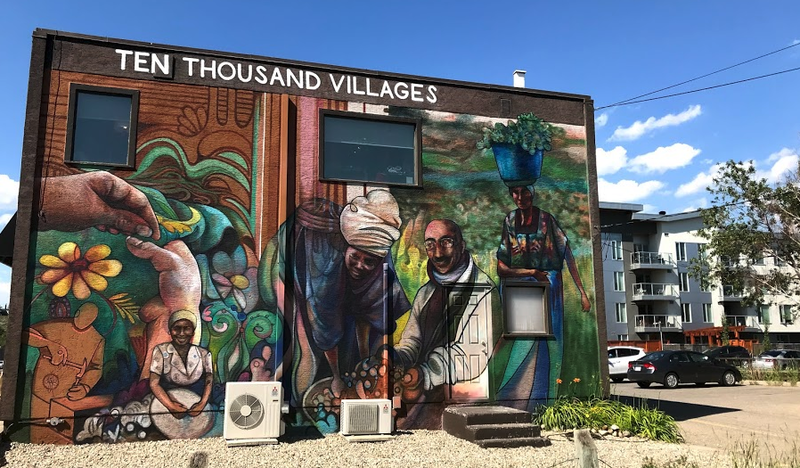 For most Calgarians, the image of inner-city neighbourhoods is one of tree-lined streets with a mix of small, mid-20th century bungalows and large new two story infill homes. There might be an old school or two and a small shopping plaza and but not much else. 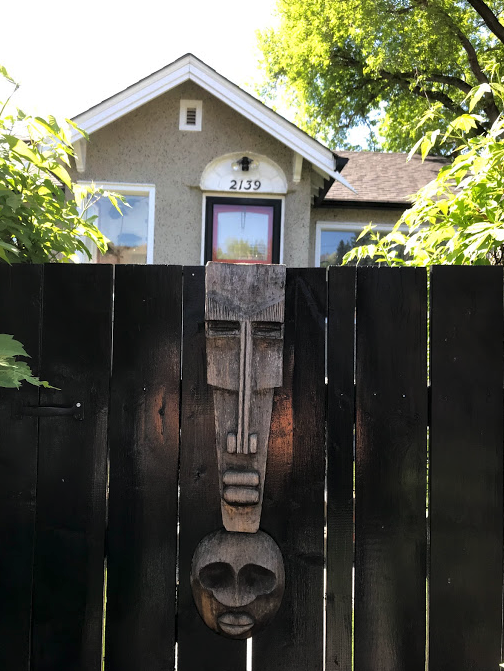 Living in West Hillhurst for 25+ years I have come to appreciate the hidden diversity of my community, which I expect is true for many other inner-city neighbourhoods in Calgary. Let's go for a West Hillhurst adventure, as my four and two-year old neighbour boys would say when they want me to take them for a walkabout of our neighbourhood. We always find something new even after over 100 adventures. West Hillhurst has strange boundaries. It would seem more logical for the boundary to extend to 29th St on the west and 14th Street on the east? 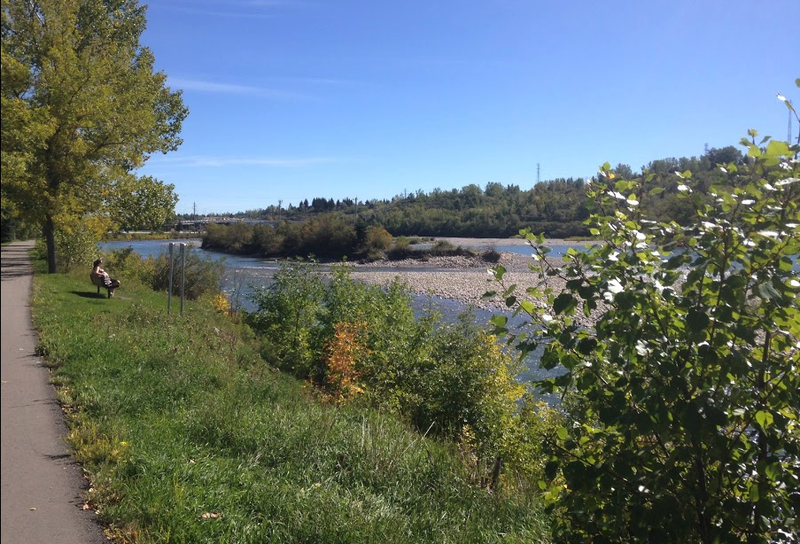 Note the south boundary includes the southern shore of the Bow River, which means we have some great beaches and pathways. A map from the early 20th century illustrates how the boundaries and names of the neighourhoods have changed. I love the name Parkdale Happyland, perhaps we should bring it back. 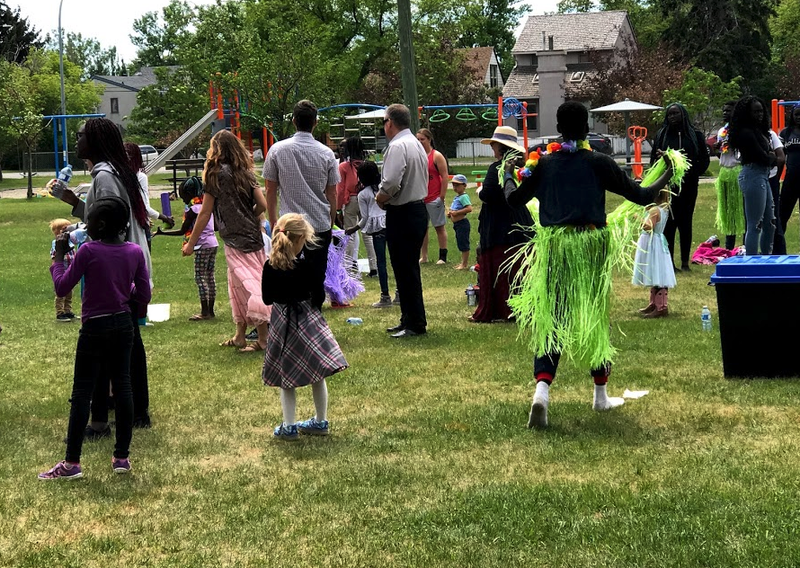 A Sunday morning church picnic at Grand Trunk Park attracts all ages and backgrounds. 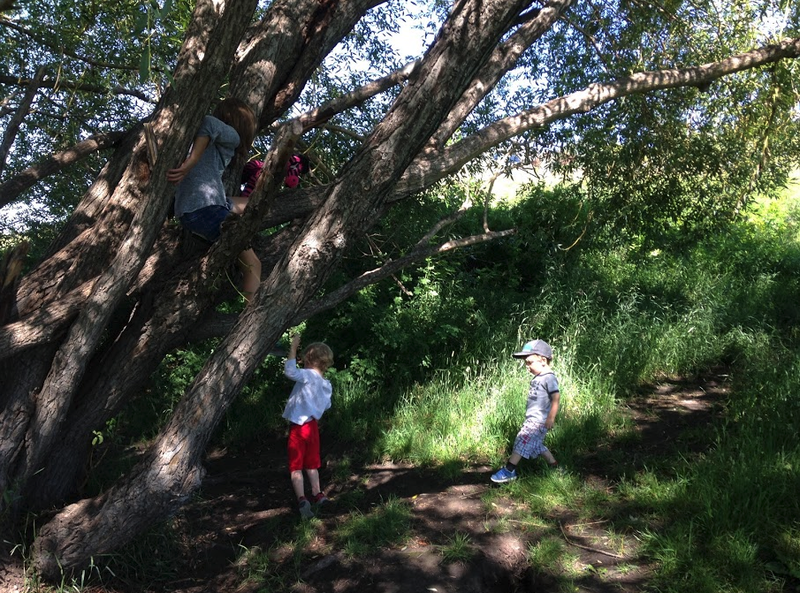 We have great climbing trees, who needs climbing walls? Our outdoor pool is a great gathering place in the summer. 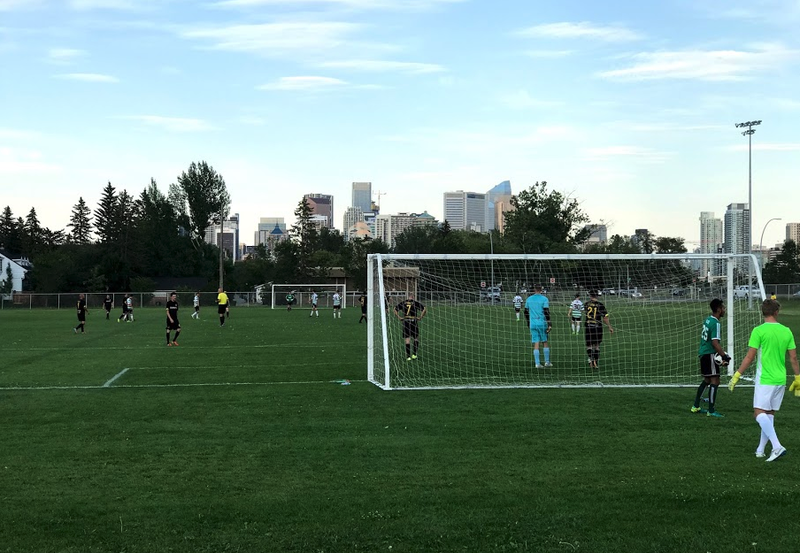 The Bowview field is one of the best soccer field in the city and attracts some of the best soccer players in the city. We also have numerous other soccer fields for those learning the game. 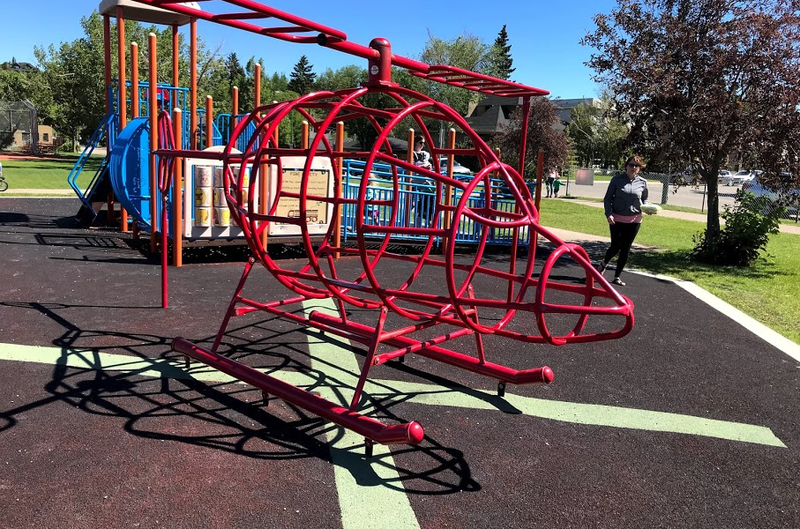 Helicopter Park is one of the most popular parks in the City. The name comes from the fact that the STARS helicopter takes off and lands at the nearby Foothill Medical Centre. West Hillhurst has five funky playgrounds, in addition to school playgrounds. We have some of the best dressed playground Dad's in the city. 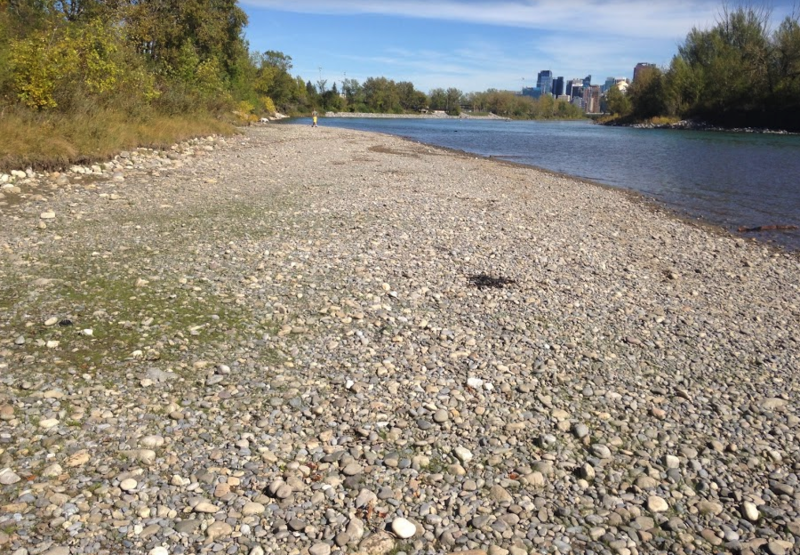 We even have our own stretch of the Bow River, with our own islands. We have several lovely natural pebble beaches. Our dog park is busy year-round. It offers great views of the downtown skyline. 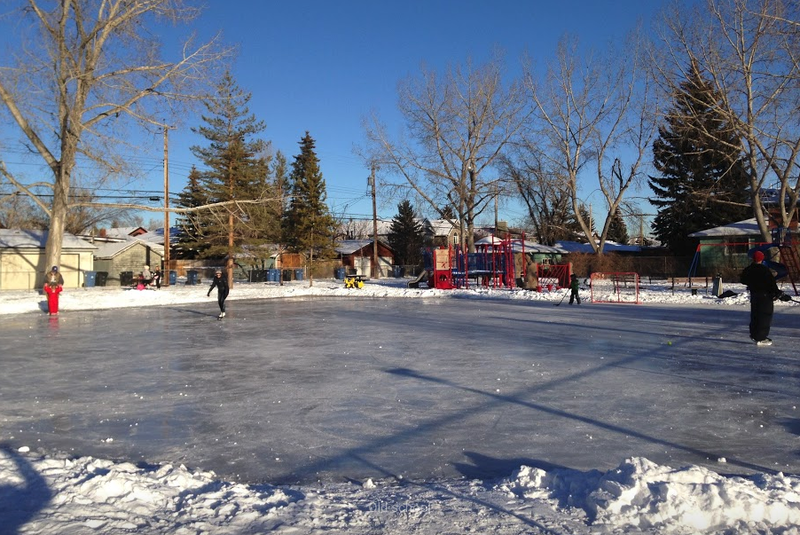 We have several outdoor skating rinks in the winter, like this one that is shared by hockey players and figure skaters. We even have our own luge/bobsled track. West Hillhursters love to cycle. While we don't have any cycle tracks we do have the highest number of people cycling to work of any neighbourhood in Calgary. We start them young! West Hillhurst's multi-use courts are use for both tennis and pickle ball. Inside is a very popular squash club. 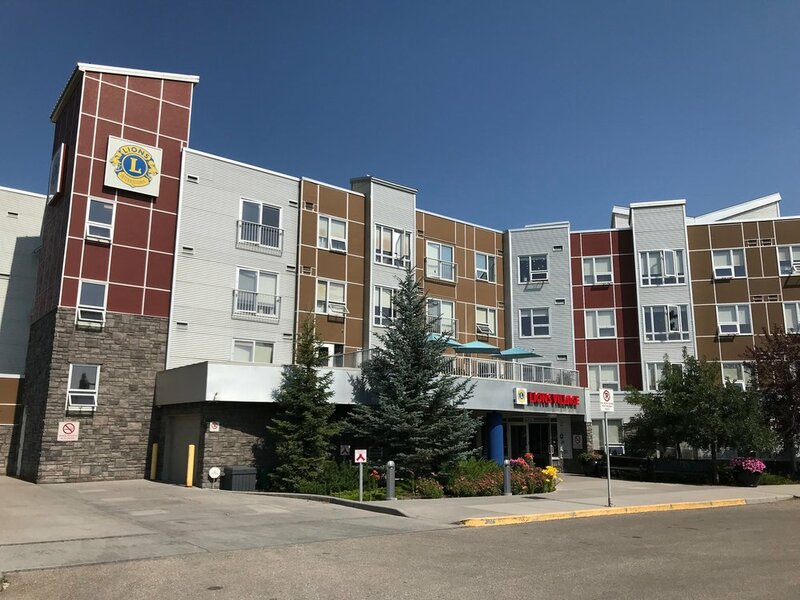 Centre 2507 operated by the Calgary Drop-In Centre is a safe place for homeless to sleep. The mega Bethany Care Centre is located at the NE edge of the neighbourhood. The Louise Dean Centre (formerly the Kensington School) is for young moms with children. 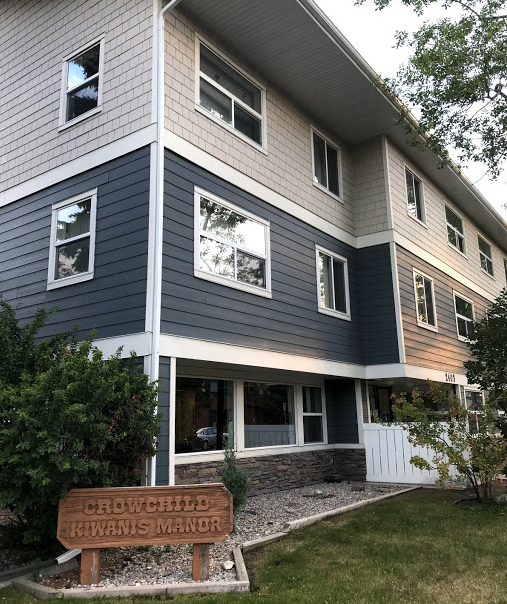 Crowchild Kiwanis Manor is just one of several senior care facilities in our community. 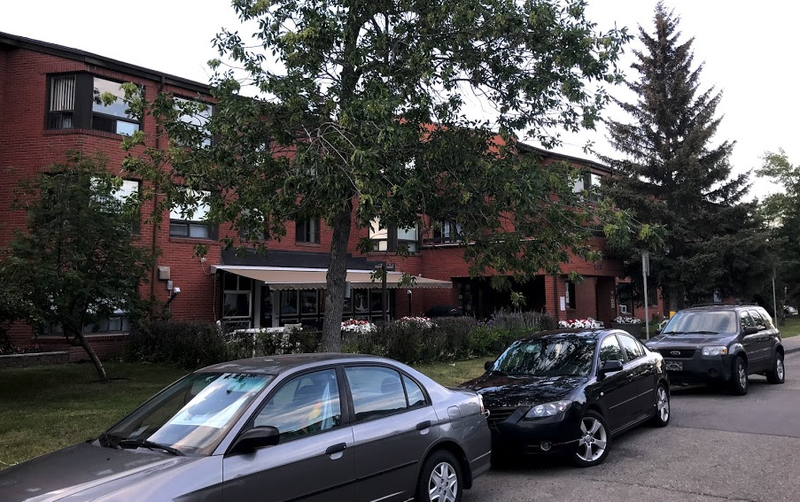 The Parkdale Kiwanis Manor is located across the street from the Crowchild Manor above. Don't let the name fool you, it is located in West Hillhurst. Bow view Apartments is owned by Highbanks Society. It provides shelter and access to education and resources for single moms 16 to 24 years old. The Dairy Lane operating since 1950, is Calgary's iconic diner. They make a classic milkshake. 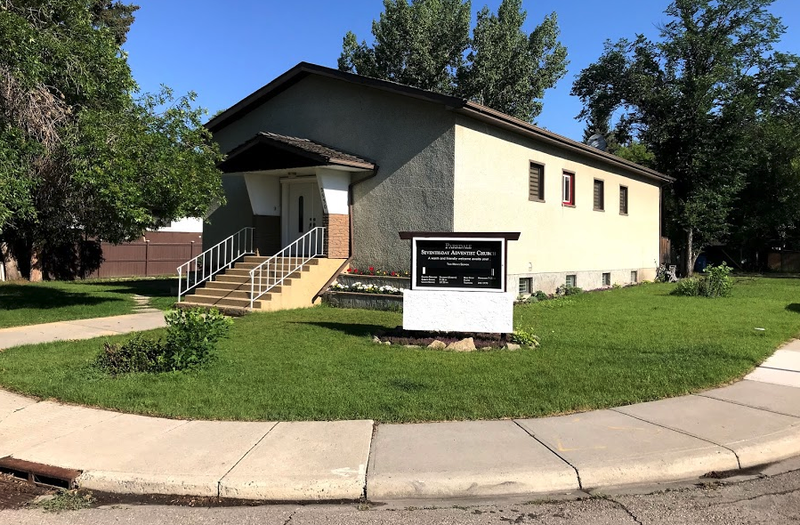 The West Hillhurst Gospel Hall is where Paul Brandt began singing as a child. West Hillhurst has several churches but you might miss them as they often look like houses. This is the Faith Chapel of Hillhurst. This is the Parkdale Seventh Day Adventist Church, but it really is in West Hillhurst. 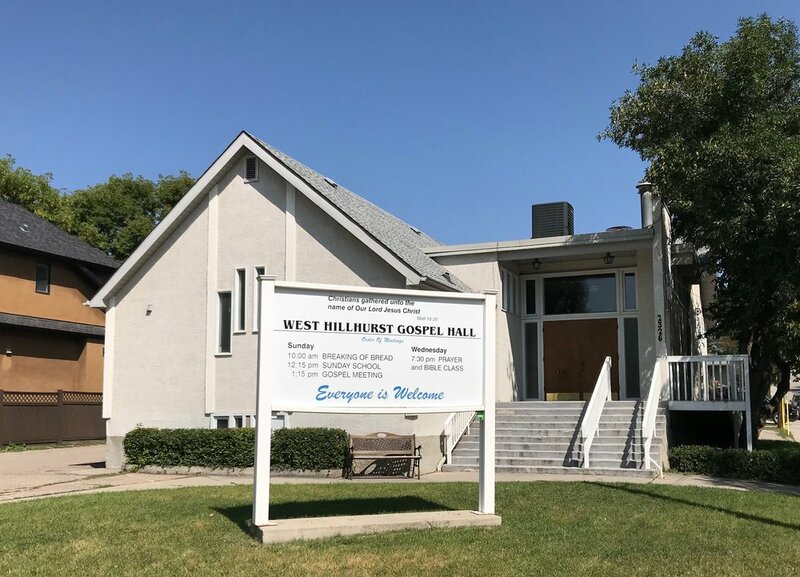 Parkdale Grace Fellowship is also located in West Hillhurst. 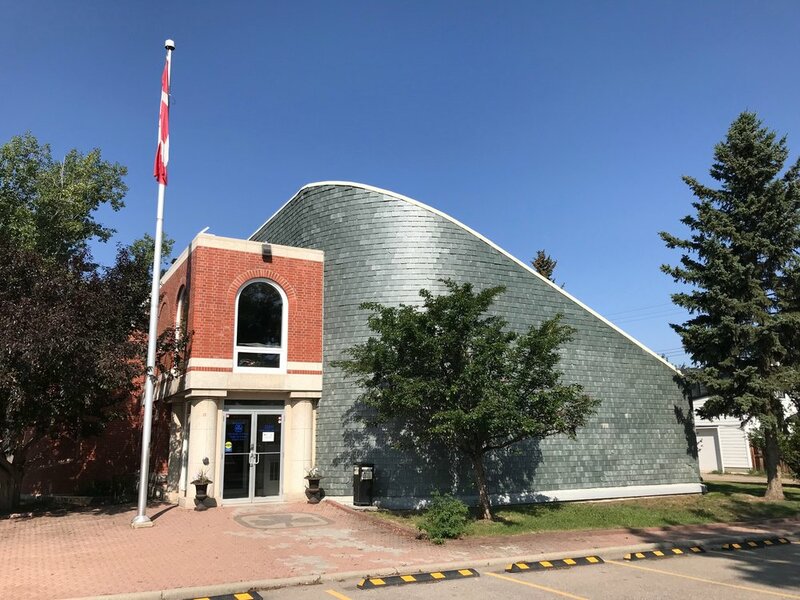 The Girl Guide of Canada building design has a funky juxtaposition of traditional and contemporary elements and materials. 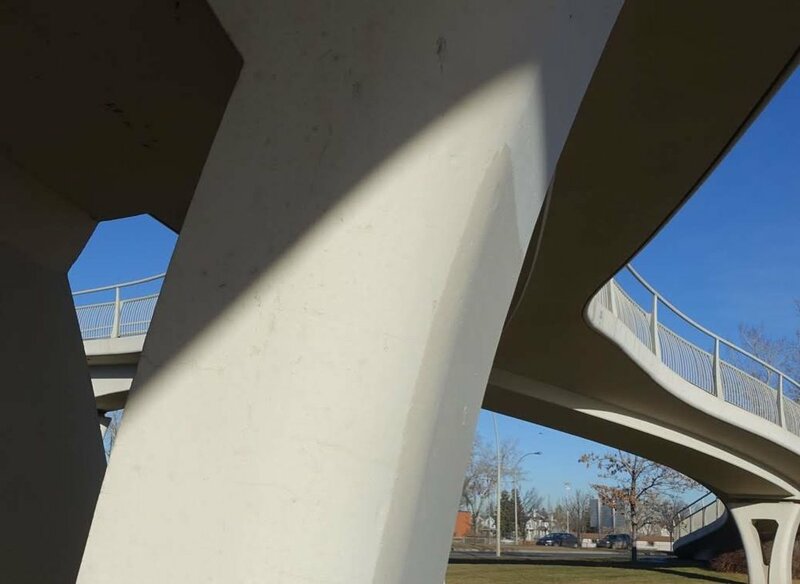 We have a very cool curvaceous white pedestrian bridge by a "no name" designer. Ours goes over a river of cars not water, but otherwise it is just as beautiful as those famous ones down the road. 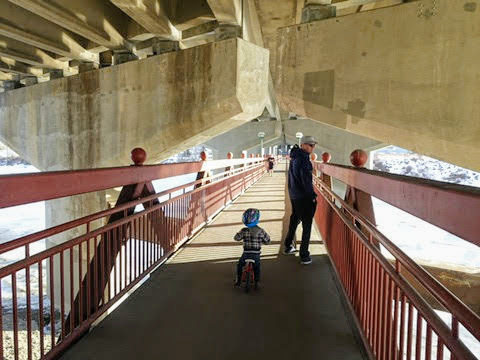 The Dave Freeze pedestrian bridge does cross the Bow River underneath the Crowchild Trail bridge. Backstory: This bridge cost the City nothing as Dave an avid walker paid for it as a gift to Calgarians. It was designed I believe pro bono by Calgary architect Bill Milne, a good friend of Dave. 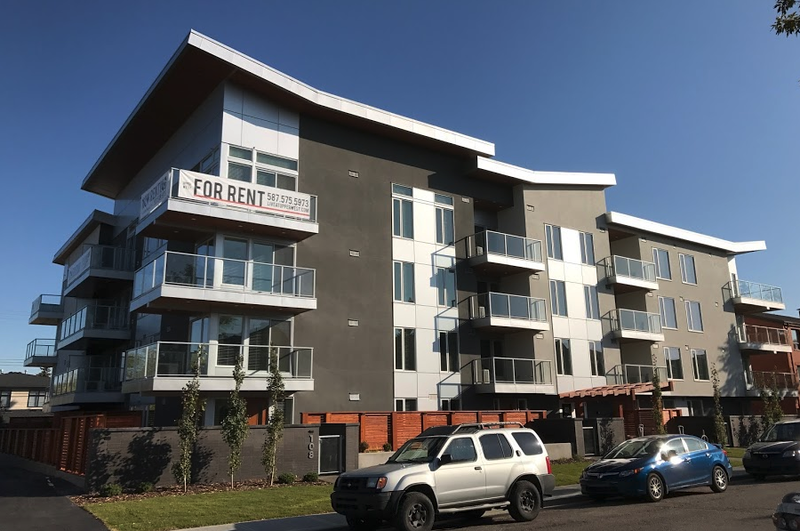 The Lions Village our newest seniors complex, by NORR combines an industrial and contemporary look, which is fitting as it is located next to a major ENMAX transformer. The Kensington Clinic (abortion) designed by Caglary architect Andrew King is emblematic of minimalist modern architecture. 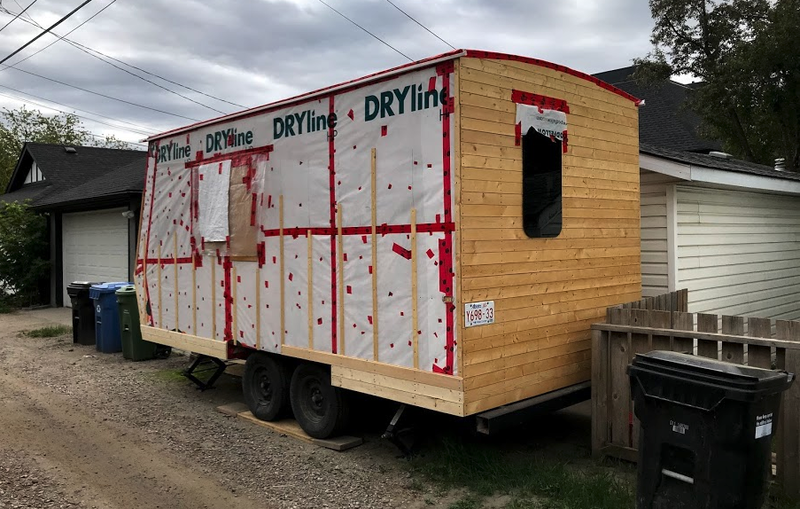 Backstory: The area around Crowchild Trail and 5th Avenue NW has been home to an abortion clinic for decades. This round mid-century building is currently being converted into a medical facility. 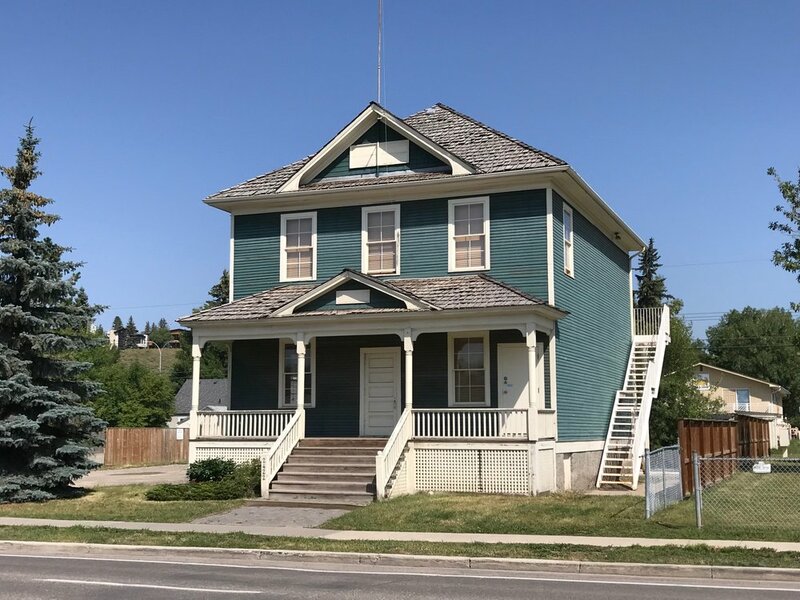 The Grand Trunk School built in 1911 is one of the oldest buildings in Calgary outside of the downtown. West Hillhurst is also home to the Thomas Riley House built in 1910. 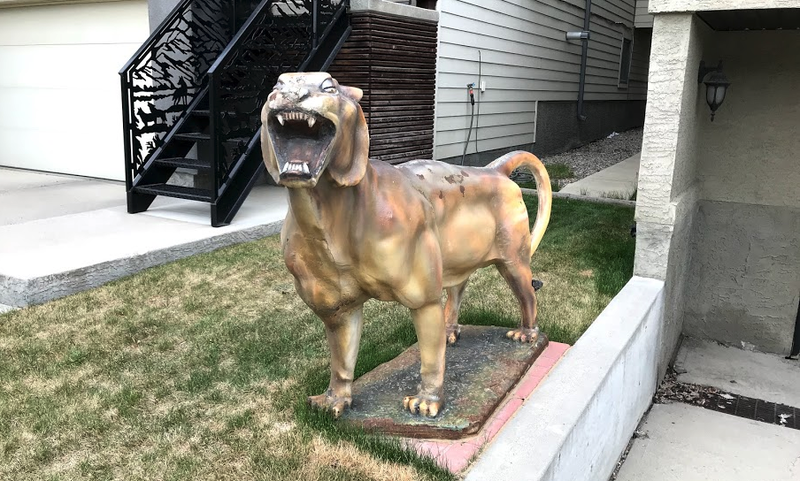 Backstory: It was sold for $1 in 1987, as it had to be moved from its original 24th Street and 7th Avenue NW location to allow for the widening of Crowchild Trail. Today it is hidden in the back alley of 8th Ave and 28th St NW. FYI: At one time it was an abortion clinic! 19th Street NW, West Hillhurst's main street is undergoing a renaissance with new shops like Made by Marcus Ice Cream. The Daylight Grocery store has been operating for over 50 years. If you are a camper or a hiker, you probably know about SA Meat Shops as their dried meats are very popular. SA provides a range of meat products, baked goods and grocery items unique to South Africa. We also have Jan's Meats & Deli, an authentic Polish Market offering fresh meats, specialty cheeses and other groceries. I am in love with the apple strudel. 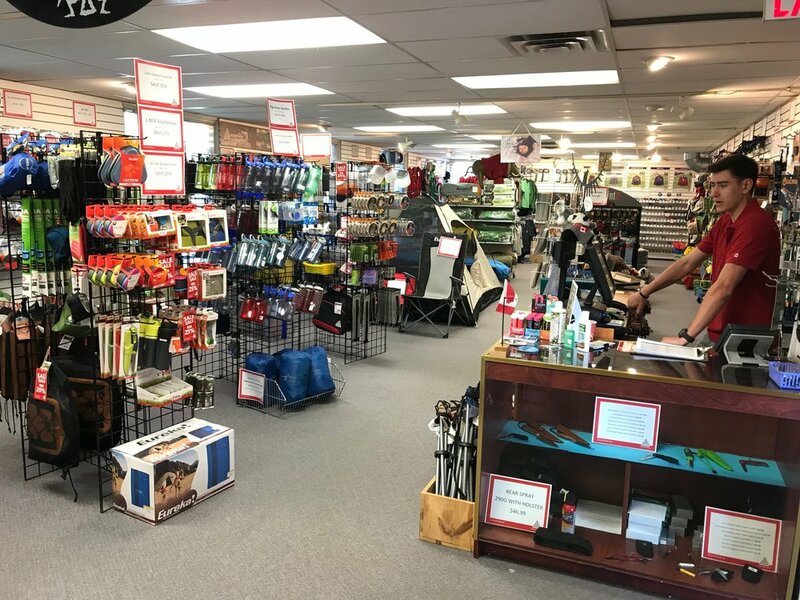 The Scout Shop is a hidden gem for campers. I am told they have great deals on tents. Fashionistas love their collection of badges. The new Kensington Legion building combines an neighbourhood restaurant with a Legion lounge and office space. It is the first phase of a mega redevelopment of the Kensington Legion site, that will create a mix-use hub at the corner of Kensington Road and 19th St NW. It is also an example of West Hillhurst's new architectural renaissance. West Hillhust is full of small businesses like this one that are integrated into the community. District Ventures is an accelerator for start-ups in the food and agricultural sector. Vintage Cafe is one of the many new small businesses in West Hillhurst. They recently opened a second store in Cross Iron Mills. St. Lawrence Bagels opened recently at 2638 Parkdale Drive with a wood burning oven. The owner/baker spent 10+ years working at Montreal's iconic St. Viateur Bagel Shop. Amato Gelato is one of many pedestrian oriented shops along Kensington Road. We even have some back alley industries. Artists make good use of our pebble beaches to create very interesting installations. We don't have any museums but we do have this very interesting gate. We do have a big angry cat scultpure? We have lots of little libraries. 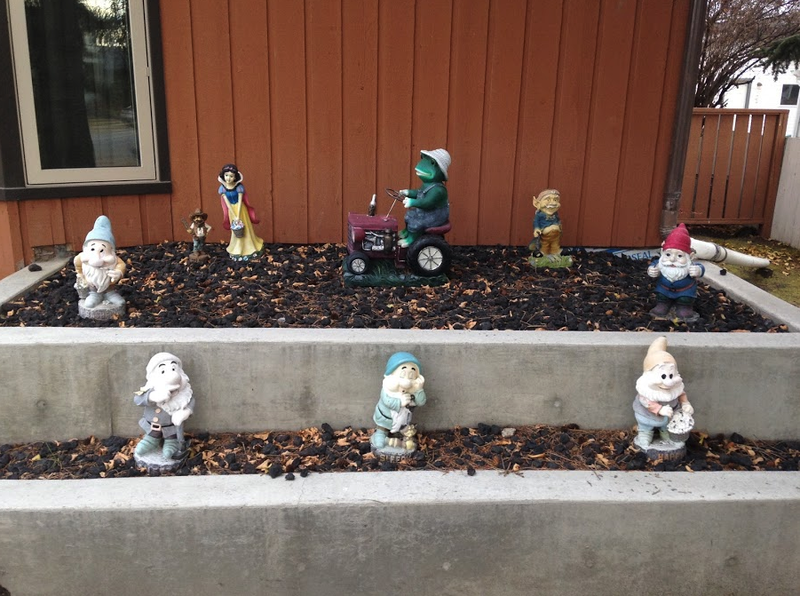 We might not have a giant blue ring, but we have lots of little gnomes. We also have a classic sculpture garden. We are also adding to Calgary's growing number of murals/street art. We also have a cow from the Udderly Art project. New infills come in all shapes and sizes, from modern to traditional. Post war homes are still abundant in West Hillhurst. Gradually the community is transitioning to early 20th century infills to accommodate more families. We are seeing more and more lane homes being built in West Hillhurst. We also have walk-up row housing. Crowfoot Trail Divide? 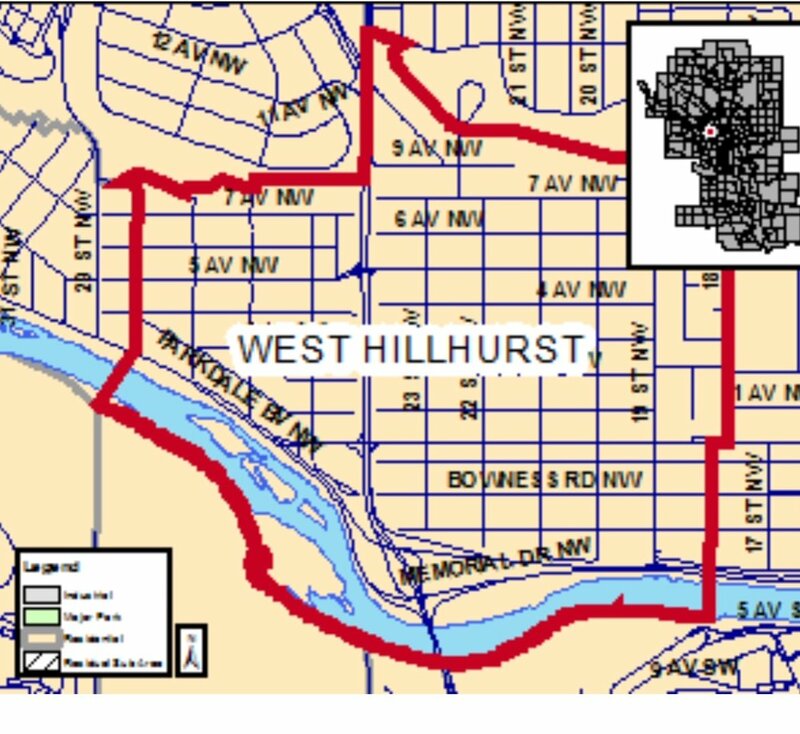 Crowfoot Trail divides West Hillhurst in half - east and west. Many people think the west half is in Parkdale. It is currently undergoing a mega makeover that will hopefully be more pedestrian, cycling and driver friendly. The old Kensington Legion is gone, soon to be replaced by a mid-rise condo with main floor retail. This will be a game changer for our community. Hope you had a great day exploring West Hillhurst with me. 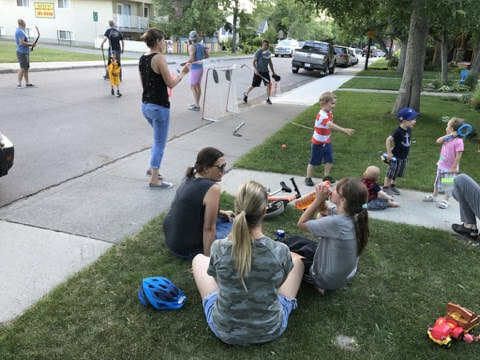 Recently, Avenue Magazine published their Calgary Best Neighbourhoods for 2018 and the results were surprising. The methodology involved surveying Calgarians re: what is important to them (restaurants, cafes and bars, walk and transit scores, community engagement, crime rates and access to parks, pathways and recreational opportunities) and then all 185 neighbourhoods were ranked based on relevant data from various sources. This was not a popularity contest as is often the case with neighbourhood rankings. Interestingly, Hillhurst ranked #27 and Inglewood #50, both of which have been ranked as some of the best neighbourhoods in Canada by professional planners. Hmmmm....what does that say? 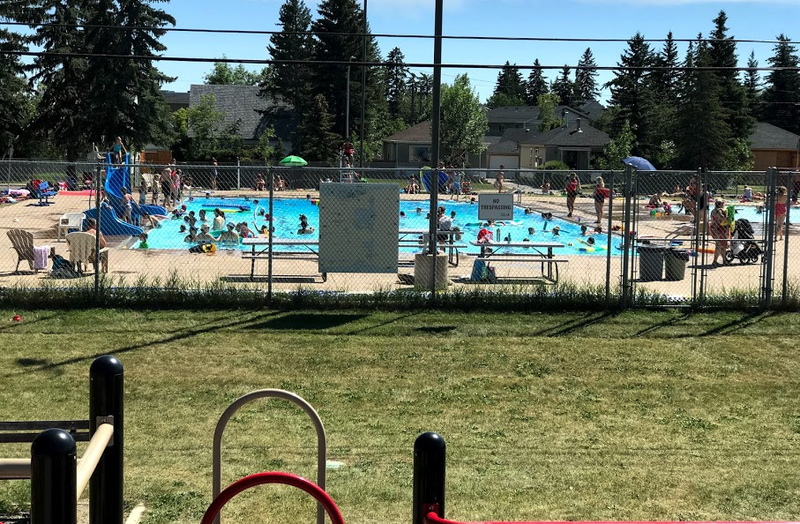 West Hillhurst was ranked #105, just ahead of Collingwood (106), North Glenmore Park (107) and Midnapore (108) and behind the likes of Glendale (102), Southview (103) and Britanna (104). Everybody knows what makes a great neighbourhood is having great neighbours. These are mine. For me is having great neighbours, which we have had for the entire 25+ years we have lived here. It is also about great accessibility to all of the things like to do, some in walking distance, some just a 5 or 10 minute drive. We have never been big transit users. I am not about to question why West Hillhurst was ranked so low. But, perhaps it is because what makes a great neighbourhood isn't really measurable. It is personal! Aspen Woods: Home to Calgary's "Nouveau Riche"
For as long as I can remember, I have thought playgrounds should do double duty as sculpture parks. 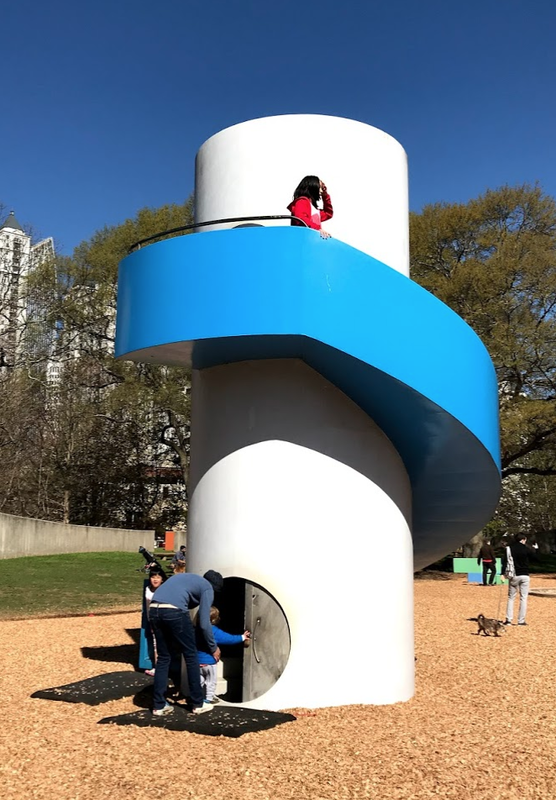 To my delight, while exploring Atlanta’s large and lovely Piedmont Park recently, I discovered they have a playground designed by renowned sculptor Isamu Noguchi. 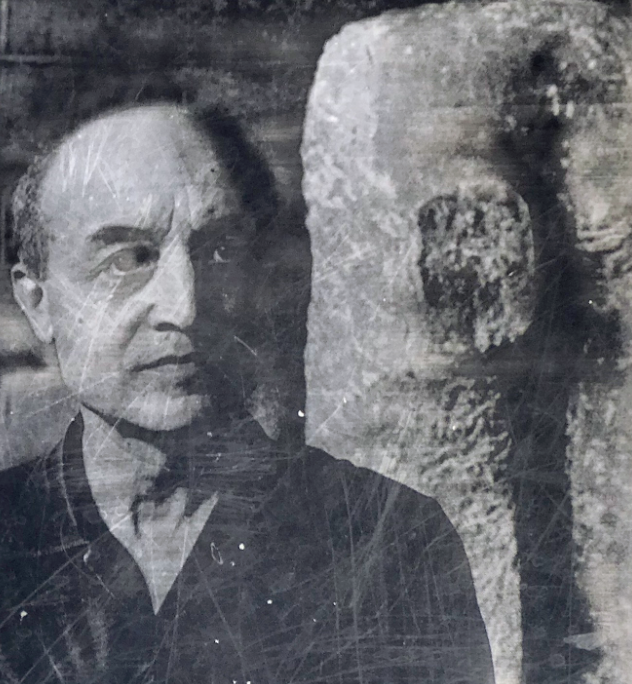 Noguchi was born in Los Angeles in 1904 and during his lifetime (he died in 1988), he designed a vast array of art - from abstract sculptures to gardens, to furniture and fountains, to parks and plazas. The Piedmont Park playground entitle “Playscapes,” was commissioned to honor Atlanta’s bicentennial and opened in 1976. The playground is spacious with lots of room between the different sculptural elements which is what gives it a sculpture park look - each piece having its own space that allows you to walk around it. While Playscapes has traditional playground equipment, i.e. slide, swings and sand box – they all have a contemporary sculptural twist. Each piece has a dominant shape – cylinder, rectangle, triangle and square which remind me of the infant toy that you have to fit different-shaped blocks into the right holes. I love that children get to climb into the lighthouse-like slide and can see through or crawl through some of the pieces. While Noguchi uses bright colours, they are more somber than the bold, neon-like colours of the cookie-cutter new playgrounds across Canada today. Have a look. Let me know what you think? Here is a collection of photos taken in other cities of public art and playground structures that could easily be integrated to create a playground that is also a sculpture park. Everybody loved this temporary installation of hammock swings in Mexico City's Central Plaza. They would make a great addition to a community park. I love the idea of moving them every few weeks. Found this sculpture in downtown Hamilton, that looks exactly like a child's toy. Wouldn't it be fun in a playground? Wouldn't it be great as an interactive piece of art? Too bad it is located in a place devoid of any sense of public animation. Found this fun playground in Berlin. It a whimsical fairy tale appearance that was both sculptural, functional and playful. This chair/sculpture in downtown Palm Springs would make for a fun playground element. Kids would love to climb it, sit on it and crawl under it. I know some of you are saying "what about the sharp corners?" Well our Grand Trunk Playground has a playground piece with similar corners and it was Canadian Standards Approved. This public artwork by Calgary artist Jeff de Boer at the entrance to the ENMAX Park at Stampede Park would be a fun addition to a playground. I have often wondered what Jeff would create if he was commissioned to design a playground. Calgary's Westmount Park has several sculptural elements like these two in its playground. Calgary's Grand Trunk Park's teeter-totter has some nice sculptural characteristics. This contemporary teeter-totter could easily be a work of art. Many of the new playgrounds have artistic qualities to them if viewed from the right angle. Personally, I try to live everyday with the curiosity of a child.